Mmmmmm. Queso Fresco. Soft fresh cheesy goodness. I am adoring this new-to-me cheese… I don’t know if it’s because it reminds me of all the amazing meals I had in San Miguel, or just because it’s amazing. It hardly matters, it’s divine: creamy without being too rich (because it’s a fresh, unaged cheese after all), with a really light and fresh summer flavour. It works so well in melty things (like quesadillas or burritos) and makes me marvelously happy. 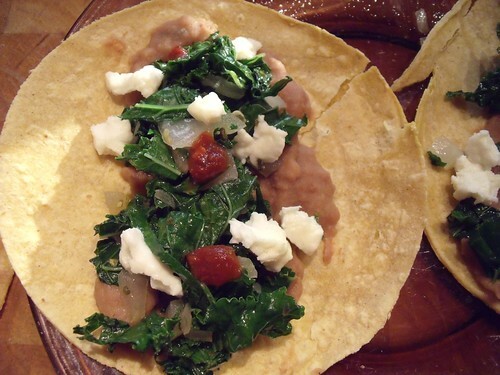 The pairing with refried beans is something I had in my Mexican breakfasts, and it works equally well in these soft tacos. I got my fresh & local goats’ milk Queso Fresco from the lovely Ruth of Monforte Dairy at my farmers’ market. She described it as similar to an unstretched fresh mozzarella, great with tomatoes. Of course, I was sold. I know you can also find it at your Mexican or Latin grocery store. It’s a great substitute for anywhere you’d use mozzarella or Monterey Jack. You can get these tacos to the table in under ten minutes: provided you already have some refried beans on hand. I’ve found a low-fat canned version with green chilis that I keep around for just such speedy meals. If you have homemade, that would be even better! Feel free to serve these with your favourite salsas. I bet they’d be divine with Roasted Tomatillo or Roasted Tomato Salsa. 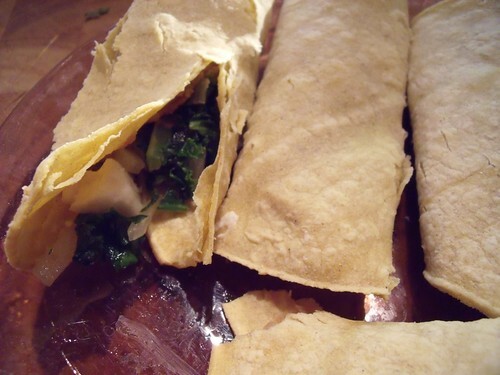 Warm tortillas and refried beans in the oven or microwave while you prepare the rest of the components. Heat olive oil in a pan and sweat onions until translucent over medium-low heat. 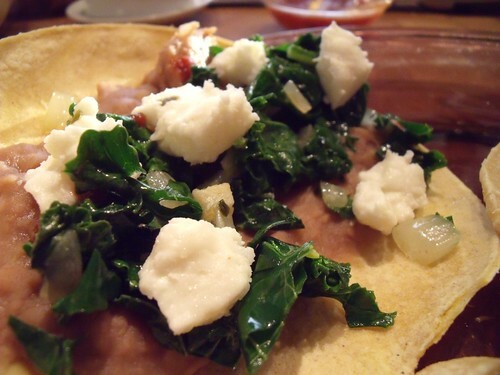 Add kale and jalapeno or chili flakes, and cook for another 30-60 seconds, until the kale is bright green. Remove from heat and set aside. 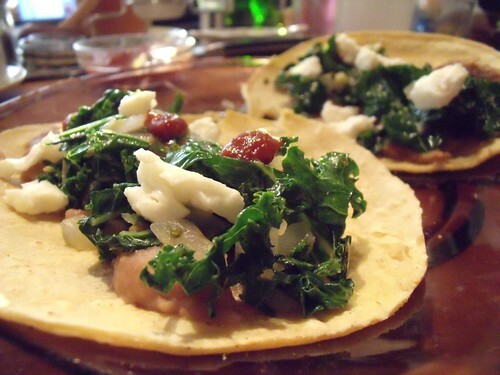 Spread a layer of refried beans over each tortilla. Top with a generous scoop of kale/onion mixture, then top with crumbles of cheese and small dollops of chipotle sauce or salsa. Roll up and enjoy! You may need a fork to catch the extra bits that fall out. Mmmm. I need to try that cheese!